Not a update on Scarlett as there is not a lot out there at this time but on my new site, After months of working on this I have at last opened my new site on Caity Lotz so if you like Legends Of Tomorrow or DCTV world then you can all check out at Caity-Lotz.org and I hope you see you all there. Just a quick little note to say that staring tomorrow I will be going away till Sunday to see some old friends and go to the London Film And Comic-Con, I will not be taking my laptop with me so no updates till I get back and please try not to email me but if you do don’t expect a response till I get back. I did not think I would have to post this but over the last couple of days I have been getting some not so nice emails from people who think I am Scarlett telling me how awful (that is me understating it) I am for trying the role in the Rub & Tug movie. Now I AM NOT SCARLETT JOHANSSON I am JUST A FAN I have no control over what Scarlett dose in her life of what roles she go’s for and it’s not my place to question it on here. So please don’t send me any more emails as they will not get to her and I will just block you. Hey all, Just a little message to say I’m going away tomorrow to London for the Heroes and Villains Fan Fest for the weekend, And my laptop will not be with me so please no email’s or things like that till I get back on Monday thanks. Scarlett’s other new movie Isle Of Dogs is about to hit cinemas soon, and promo videos and interviews are now hitting the web, and here is a “Meet The Cast Video” but it’s done in stop motion, it’s a very cool touch. Tomorrow I will be going away for a nice little holiday to Chicago for my bday, In this time I will have little to no internet when I am in America so there will be no updates on the site till I get back to the UK. All the Scarlett updates I miss will be added in when I’m home and please no emails as well till I’m back. The promo for Rough Night is kicking off now and the girls did a interview were they did dares and answer fan-questions while playing Giant Jenga for BuzzFeed Celeb. As you can now all see Scarlett Johansson Fan has a new look up not just on the main site but the gallery as well, After the drab winter we have had it was time for the site have a more happy and light look. Both the main layout and the gallery were done by one of my favs umitohoshi using one of Scarlett’s photos from the Marie Claire shoot and her total film cover. I do hope you all enjoy the new look. I would just like to take this time to wish everybody here on Scarlett Johansson Fan a very happy Christmas day and I do hope you all have a great time and get all you want from the day. 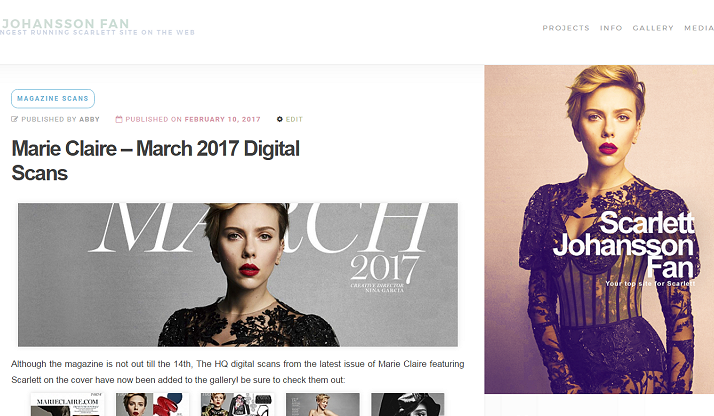 As you all should have seen over the last couple of day’s Scarlett Johansson Fan has a new look up on both the main site and the gallery, The main layout was done by On My Morning and the header that is using Scarlett’s 2016 Cosmopolitan photoshoot was made by Never Enough Design . I hope you like them as much as I do. Hey I just want to say that I will be going away from tomorrow (15th) to Monday (20th). I will be heading to a Buffy Conventions and in this time I will not have my laptop with me so please if you do email me I will not be getting back to you till monday. 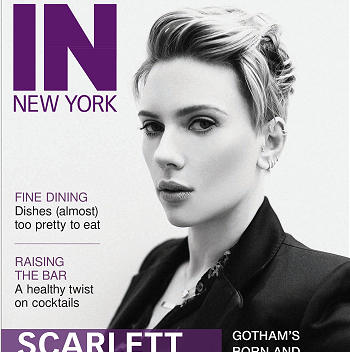 Enjoy your weekend and see you all soon with more Scarlett news.